Jones has been a trial lawyer since 1978. Prior to Jones Kelleher (2014) he was a founding partner at Cooley Manion Jones, managing the contingent fee practice for thirty years. Patrick has tried medical malpractice, product liability, civil rights, construction site, eminent domain and general liability tort cases. In 2012, he was invited to join the International Best Lawyers Advisory Board. This distinguished group represents some of the world’s most preeminent law firm leaders. Jones Kelleher is currently handling a wide variety of catastrophic personal injury cases, from complex medical malpractice claims, to construction-site injury and wrongful death claims, to serious motor vehicle cases. Each case is handled by two attorneys, a paralegal, and the appropriate level of administrative support, bringing the full resources of the firm to each matter. Every case stands on its own individually. Multimillion dollar recoveries are routine. 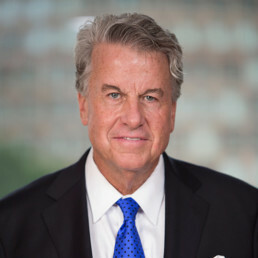 Jones Kelleher’s 10-attorney practice has achieved some of the largest and most high profile verdicts and settlements in the region, including a $43 million recovery for victims of a nightclub fire, a $7.5 million recovery for a worker seriously injured in a propane explosion, a $7 million recovery in a medical malpractice case relating to injuries suffered by a newborn, and a $2.85 million recovery for a passenger seriously injured in a motor vehicle collision. Jones Kelleher’s attorneys are routinely recognized by their peers for their legal ability. The firm was ranked as Tier 1 in Boston for plaintiffs’ medical malpractice law and personal injury litigation by U.S. News & World Report—Best Lawyers “Best Law Firms” (2015, 2016). The firm’s unwavering commitment to community service is longstanding and well-recognized. Jones is a past president of the Rhode Island Association for Justice (RIAJ) and the Massachusetts Academy of Trial Attorneys (MATA). A Director at Pine Street Inn, Jones spearheaded the Inn’s Boston Legal Community House Project, an effort that successfully raised $1 million from within the legal community to build a new residence that will provide permanent supportive housing for chronically homeless guests of the Inn. Jones also serves as a member of the Board of Directors of Roger Williams University School of Law, in addition to Citizens Energy Corporation. Partner Patrick T. Jones has been a trial lawyer since 1978 and works on substantial personal injury and medical malpractice cases. 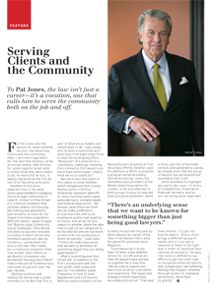 Prior to opening the law firm of Jones Kelleher, Patrick was a founding partner of Cooley Manion Jones, where he managed the contingent fee practice for over twenty-five years.